The State Department summoned Turkey's ambassador after bodyguards and supporters of President Recep Tayyip Erdogan beat protesters outside the Turkish embassy earlier this week. A State Department official said Ambassador Serdar Kilic met Wednesday with Under Secretary of State Thomas Shannon — a day after the embassy violence. "Violence is never an appropriate response to free speech, and we support the rights of people everywhere to free expression and peaceful protest," State Department spokesman Heather Nauert said. "We are communicating our concern to the Turkish government in the strongest possible terms." Republican Senator John McCain, head of the Senate Armed Services Committee, wants even tougher action. "We should throw their ambassador the hell out of the United States of America," McCain told MSNBC's Morning Joe broadcast Thursday. Other U.S. officials also criticized the Erdogan supporters as the aggressors against peaceful protesters, saying their actions outside the Turkish ambassador's residence violated American protections on free speech. U.S. 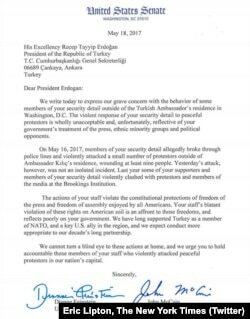 Senators John McCain and Dianne Feinstein wrote a letter to the Turkish government, demanding it take responsibility for a clash involving protesters and President Recep Tayyip Erdogan's guards near the Turkish Embassy in Washington on Tuesday. The embassy blamed the violence on groups linked to the Kurdistan Workers' Party (PKK), saying they "aggressively provoked Turkish-American citizens" who had gathered to greet Erdogan. "The violence and injuries were the result of this unpermitted, provocative demonstration," an embassy statement said. Turkey regards the PKK as a terrorist group. Tuesday's fight outside the embassy injured 11 people, at least one critically. It took place just hours after Erdogan met with President Donald Trump at the White House. Video appeared to show Erdogan's bodyguards hitting and kicking protesters and pulling out guns as D.C. police tried to intervene. Asked what happened, one man bleeding profusely from a cut to his forehead said, "The Turks, the Turks, the Turks attacked us." Turkish supporters, however, claimed they were provoked by members of the Turkish Kurdish party YPG, which Erdogan's government considers a terrorist group for its links to the PKK. Washington police said they were checking reports that two men who were arrested were among the Turkish leaders' guards, adding that other suspects were being sought. Mayor Muriel Bowser condemned the violence. "A violent attack on a peaceful demonstration is an affront to D.C. values and our rights as Americans," she said. "The Metropolitan Police Department will continue investigating the incident and will work with federal partners to ensure justice is served." 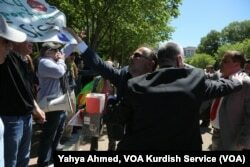 FILE - A pro-Turkey demonstrator tries to rip a sign from the hands of a pro-Kurdish demonstrator outside the White House, where U.S. President Donald Trump was hosting Turkish President Recep Tayyip Erdogan, May 16, 2017. Police Chief Peter Nesham called reports of guns by the pro-Turkey side "very dicey," adding: "I will say that is not something that we will tolerate here in Washington, D.C."
Republican senators McCain and Ben Sasse separately criticized Erdogan's supporters on Twitter. "This is the United States of America," McCain wrote. "We do not do this here. There is no excuse for this kind of thuggish behavior." Sasse said Erdogan should "remember that this country is built on free speech, free religion, free press and freedom to protest." The two sides of supporters swapped allegations of what set off the melee. VOA's Turkish Service said the protesters were Kurdish supporters of pro-Kurdish lawmaker Selahattin Demirtas who were calling for his release from prison. Police barricaded the perimeter to separate the groups. The protesters said they were suddenly charged by Erdogan's guards and supporters. Similar clashes happened last year when Erdogan visited Washington for a nuclear security summit. "We were the first to arrive at the protest location, we were few, and we did not want to provoke Erdogan's supporters, as we had an experience with them," said Lucy Usoyan, an Armenian-American activist. "We started to chant 'Long live U.S.A., long live Kurdistan and Armenia,' so all of a sudden they broke into us, they beat us badly, and the U.S. police was not enough to protect us. Turkish Protest Outside Brookings Institution in Washington D.C.
"I saw blood everywhere. For a second, I thought that I am not in the capital of the U.S., but in Turkey being beaten by Erdogan supporters," Usoyan said. Gunay Evinch, a Turkish-American lawyer, said the attacks were "started by the pro-YPG Kurdish protesters." "They crossed the line which they were not supposed to. U.S. police did not move in right away. In that case, there is the rule of 'hot pursuit.' Turkish police felt they had to intervene," said Evinch, who is very active in the Turkish-American community and has defended the Turkish government in some U.S. cases. In Turkey, Erdogan's rule has become increasingly authoritarian, particularly after a failed coup attempt last July. Tens of thousands of people have been jailed since then, and Erdogan narrowly won a disputed referendum last month that will grant him more power. A video shot by VOA's Turkish Service was widely broadcast in the U.S. and elsewhere, including on Fox News Turkey and CNN Turkey, though most smaller stations in the country did not air it. VOA's Turkish and Kurdish services, State Department Correspondent Nike Ching and VOA's Extremism Watch Desk contributed to this report.